To provide some raw numbers, in 2005, the last year for which the DOJ statistics are available, 10,285 African-Americans committed murders. As 8.8% of these were “black on white,” there were, assuming only one death per murderer, 905 whites killed, almost 2.5 per day. 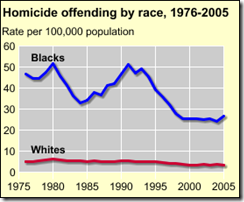 In the same year, again assuming one killing per perpetrator, 267 blacks were murdered by whites (3.2% of 8,350 killings). Crime is a young man’s métier. The vast majority of the 52.2% of U.S. murders committed by African-Americans are the work of the roughly 2% of the population who are black males between the ages of 15 and 25. Would these figures, courtesy of Eric Holder, surprise most Americans? Not if you scroll down to the comments in local papers below stories of murders, like this one on March 31. Not if you judge by demographic trends since the 1960s. But this is a subject that cannot be mentioned by the national media. With rare exceptions, when blacks kill whites, it’s local news. Black on White crime is routinely white washed, the race hidden behind the Euphemism “Man beat up by group of Youth”. So readers get a wrong impression. Q&A: “Black Youth Flash Mobs” Are Police Downplaying Anti-White Hate Crimes? Though if you do ever actually cite these things to PC bigots, I appluad you…hahaha. Zimmerman had the choice of whether or not to approach Martin; he decided to approach and initiate contact; it was his choice, his action. Martin did not choose whether or not he was approached by the other; he did not have that freedom in this matter. The primary responsibility for what happened therefore rests with Zimmerman. 1. Who started the conflict? 2. Did Zimmerman have lawful justification for using deadly force? I haven’t looked at that timeline and map in too much detail yet but suppose Trayvon did double back and confront Zimmerman. So what? Does that mean he started the fight? Does that give Zimmerman a right to shoot him? The testimony of the eyewitness named “John” has been disputed by another witness as well as forensic audio experts. John says he saw Trayvon beating up Zimmerman and Zimmerman yelling for help then later saw that Trayvon was dead. Audio experts say Zimmerman was not screaming on the 911 tapes. An eye witness who called police and reported the events as they unfolded live says that Zimmerman was very angrily arguing with Trayvon and that they did fight in the grass but Zimmerman appeared to be on top before the gun shots. The scream for help sounded to her like that of a young person which hearing the call myself I agree with. Zimmerman is going to have a tough time proving self-defense in this case considering his history of violence, him being the one caring the fireaarm, him showing hostility towards Trrayvon on the 911 call and Trayvon ending up shot dead by his hands. The convenient store surveillance video is not relevant to this case as far as I know. I have not read anything about any sort of incident that would be relevant. It’s all going to come down to whether the jury believes Zmmerman’s claim of self-defense. I think he will be convicted of murder based on circumstantial evidence. It seems that assaulting a police officer was a shove by Zimmermann. Not a punch in the face. Again, verification needed but not hard to do. There is another riddle. Why does no-one show the store surveillance video where he bought his skittles? Some people surmise that something wrong happened there. Again, no proof, but strange that nobody speaks of the seven eleven surveillance video showing Trayvon buying his stuff. @EgalitarianJay, I disagree, you can report anyone as suspicious. And the question was: did Trayvon mind his own business or was he angry and attacked Zimmermann. And without a weapon, Zimmermann might be dead, or in a coma. And no Al Sharpton would help convicting the perpetrator, like in another black on white assault beating in Sanford. Those statistics don’t justify any of George Zimmerman’s behavior. Zimmerman had no justification for reporting Trayvon as a suspicious person. He did it solely on the way he dressed and looked (e.g. a young Black male wearing a hoodie, walking alone in the rain). This is where I disagree: good law abiding Blacks should honestly accept that strange behavior by a Black male around 16-30 years old is more suspicious for breaki-ins then a 67 year old white lady. Pure crime statistics. Even if you claim his prejudices are valid because on statistics he went beyond racial-profiling here. He killed an unarmed teen that was minding his own business before Zimmerman approached him. He should have minded his own business during the approach and not been angry enough to attack Zimmermann in retaliation for being a racist profiler. And there seems not to be much doubt about Zimmermann’s injuries. Only if Zimmermann used or threatened serious aggression and force was Trayvon allowed to use such dangerous force. His first mistake was disregarding the advice of the 911 dispatcher who said they don’t need him to follow the boy he reported as a suspicious person. Actually, it seems he heeded the advice and was tracked down by Trayvon. I found a map of the area and it was clear Trayvon could have made it home in 2 minutes. It’s not part of Zimmerman’s job as neighborhood watchmen to approach and interrogate people in the neighborhood, just observe them and report suspicious activity. His other mistake was bringing a gun with him to approach Trayvon. He has a permit for the gun but he has already called police. He doesn’t need to carry a firearm on him to ask someone a question. He is not a police officer. Most likely the gun is the reason he is alive and not in coma. It is pretty clear he was beaten seriously, it is only not quite clear if Zimmermann gave Trayvon probably cause to beat him. So he initiated an encounter. An encounter that resulted in a teenager being shot dead and Zimmerman now in police custody awaiting trial for the charge of second degree murder. Zimmerman to our knowledge has never killed anyone before but this incident fits in line with his documented violent behavior including assaulting a police officer and being fired from a job as a bouncer for being too aggressive (ex. throwing and injuring a woman at a party). Trayvon’s punching a school bus driver (if that is true) trumps excessive violence by a bouncer. Consider that Zimmermann has been doing neighborhood watch for years with no incidents. You can’t hide behind statistics to justify heinous misdeeds. The racial-profiling based on statistics defense is not going to hold up in court. Zimmerman’s history of responding to conflicts with aggression and rage are going to seriously hurt his chances of being acquitted when this case goes to trial. If Zimmermann can be PROVEN beyond reasonable doubt, by a unbiased court, to not have acted in self defense, he should be punished. I hope you agree that if Trayvon attacked solely upon “provocation” of racial profiling and questioning, that then self defense applies. This is where I disagree: good law abiding Blacks should honestly accept that strange behavior by a Black male around 16-30 years old is more suspicious for breaki-ins then a 67 year old white lady. Pure crime statistics.This is where I disagree: good law abiding Blacks should honestly accept that strange behavior by a Black male around 16-30 years old is more suspicious for breaki-ins then a 67 year old white lady. Pure crime statistics. In Zimmerman’s 911 phone call he tells the dispatcher that he is reporting a suspicious person (Black male in his teens) and comments on what he is doing which is basically standing around minding his own business. Zimmerman speculates that he is “up to no good” and looks like he is on drugs. But he doesn’t witness him doing anything suspicious. He just looks suspicious to Zimmerman. So no he really didn’t have any logical justification to report Trayvon as a suspicious person beyond his own racial prejudices that because he’s a young Black man walking in the neighborhood with a hoodie he is a suspicious person. It’s not like he saw him picking a lock or trying to break into a window he was literally just walking home at night minding his own business. I’m not calling the 911 call unlawful but it isn’t justified. It’s not logical to just assume someone is a criminal when you haven’t observed them doing anything suspicious. No doubt about his injuries? Have you not seen the latest enhanced video that shows there is no fresh head wound nor sign of a broken nose? Not only can you see this with your own eyes but it has been verified by a medical doctor. The police also canceled an ambulance for Zimmerman so if he had any wounds from the physical altercation they must have been very minor. Certainly not what he described (broken nose from a sucker punch and head banged viciously against the sidewalk). As for how Trayvon should have handled the situation first of all he was under no obligation to answer any of Zimmerman’s questions. He could have kept walking and ignored him. Zimmerman has his story of what happened but Trayvon’s girlfriend says she heard Trayvon ask why he was being followed and an eye witness says she heard Zimmerman arguing aggressively with Trayvon. So we have two witnesses that contradict Zimmerman’s story. A physical altercation obviously happened but who initiated it? The grown man who was recorded by 911 calling Trayvon one of those assholes who always gets away, who has a history of violence including assaulting a police officer or the teenager who until he noticed he was being followed was minding his business walking home from the store? I think it’s obvious that Zimmerman approached Trayvon in an aggressive manner given his expression on the 911 call and two witnesses have told stories contradicting his version of events. In fact Zimmerman should have listened to the 911 dispatcher who told him he did not need to follow Trayvon. And the only person proven to use dangerous force was Zimmerman who shot Trayvon dead with a gun who can be heard screaming for help (screams confirmed NOT to be Zimmerman by audio experts). Huh? He did not heed the advice by his own admission. He got out of his car and interrogated him against the advice of the dispatcher. The nature of that encounter is what we don’t know for certain. Provide a link to this map you are talking about and how it proves Trayvon could have avoided Zimmerman. Zimmerman by his own admission called 911 from his car and got out of his car to pursue Trayvon who according to his girlfriend was walking home quickly when she told him to run to avoid his stalker. If you see someone in the act of committing a crime you can try to stop them but that’s not what happened here. Zimmerman already reported Trayvon to the police as a suspicious person but then made the conscious decision to confront him when he was told he should not do that. What happened in that encounter we don’t know. asked Trayvon questions and Trayvon refused to answer him and asked why he was following him like the girlfriend said. Does that give him the right to shout at him at the top of his lungs the way an eyewitness described? Does it give him the right to push him or grab him? Suppose Zimmerman put his hands on Trayvon first. Self-defense goes completely out the window at that point. Since the only one proven to be injured in the altercation is Trayvon (fatally) that’s just speculation. yes if Zimmerman attacked Trayvon then Trayvon’s retaliation was self-defense. But since we don’t know the nature of the encounter we can’t speculate either way. Trayvon is not alive to tell his side of the story. Did Zimmerman get sucker punched, have his head beaten against the side walk, yell for help and shoot Trayvon for reaching for his gun and threatening to kill him? Or did something else happen? Audio analysis is going to challenge Zimmerman being the one heard on the 911 tapes yelling for help. Eye witness testimony of Zimmerman angrily shouting at Trayvon before fighting in the grass is going to challenge his account that he calmly asked Trayvon questions then started to return to his car before being sucker punched. So all we are left with is Zimmerman approaching Trayvon, a struggle occurring and Trayvon ending up being shot dead. He can’t prove in court that Trayvon reached for his gun and threatened to kill him. And it doesn’t look good for him that he has a violent past while Trayvon has none. If that were true both people had a history of violence. I don’t think punching a bus driver trumps assaulting a police officer. Since I can’t find a single credible source reporting Trayvon punching a bus driver the evidence still indicates that Trayvon has no history of violence and Zimmerman has a serious history of violence. We will see what happens in the court of law. In the court of public opinion at least in my opinion I think it’s far more likely Zimmerman went on a vigilante rampage and murdered Trayvon in cold blood. I don’t think he plotted to find a Black teen and kill him. I think he simply spotted one, reported him as suspicious, decided to question him himself and when the kid didn’t cooperate with his interrogation he attacked him, was resisted by a kid defending himself, pulled out his gun and killed him for resisting or fighting back. It could have been nothing more than a push that started the altercation. Zimmerman is going to have a very hard time arguing self-defense in a case where his reputation for violence will be used against him. He brought a gun to a neighborhood watch. He didn’t listen to advice not to approach the person he reported as suspicious and his account of the encounter is challenged by at least two witnesses. Even if he does have injuries they aren’t going to help his case much because how do we know he didn’t get them in a fight that he started? The story of Trayvon fearlessly grabbing for Zimmerman’s gun while simultaneously screaming in terror for help prior to be shot is something I don’t expect the jurors to believe. I think this situation does not look good for Zimmerman AT ALL. I think he made a terrible mistake and needs to pay the price. It angers me to see those same heavily biased newspapers accusing others of “bias”. This is why I never buy a newspaper or “news” magazine; they’re just propaganda. He shouldn’t have been dressing up as a thug. He WAS a thug who committed crimes. Zimmerman had EVERY right to be suspicious. He didn’t shoot him because he was suspicious however. Treyvon decided to assault the man and he even went for the mans gun. Deal with it. The kid was a thug. Even if you claim his prejudices are valid because on statistics he went beyond racial-profiling here. He killed an unarmed teen that was minding his own business before Zimmerman approached him. His first mistake was disregarding the advice of the 911 dispatcher who said they don’t need him to follow the boy he reported as a suspicious person. It’s not part of Zimmerman’s job as neighborhood watchmen to approach and interrogate people in the neighborhood, just observe them and report suspicious activity. His other mistake was bringing a gun with him to approach Trayvon. He has a permit for the gun but he has already called police. He doesn’t need to carry a firearm on him to ask someone a question. He is not a police officer. Next Next post: 72% of blacks, 31% non-blacks believe George Zimmermann is guilty(Gallup). Why the racial differences?